Ishwara (God) is there in all the living beings. He is the wire puller in all living beings. He makes the body undergo various trail and tribulations, which actually are a result of merits of the accumulated actions (prarabdham). The body may have to bear insults or praises, live in poverty etc. The life in the body is there until it undergoes all the merits of the accumulated actions that are in store. Once the body is done with destiny(prarabdham) the life moves out. Ishwara (God) is the adhipathi (ruler) in all beings. The Upanishads contain various hymns and chanting of sages. It is Ishwara (God) who has given them this knowledge. The sages could not contain it to just themselves, they wanted to share. So, they poured their experiences out that are chronicled in the Upanishads. Bhagawan Ramana Maharishi came to know about death. Again, it is Ishwara (God)who gave him the knowledge of death. Ishwara (God)took over his speech, and through him propounded good words. These days there are rare people interested in gaining spiritual knowledge. All the time is spent on acquiring worldly pleasures just for the stomach. The sages have propounded the adhyatma (full knowledge of the self) in these Upanishads. They have said people are not interested in spiritual matters. Prayo marga indriyam and sreyo marga are the two goals. One has to discriminate between the two and choose the right one. Working for worldly pleasures and goals is known as prayo marga indriyam (means constant desire to increase wealth). But sreyo marga is that which leads a person to a higher state and ultimately dips in unlimited happiness. You worship Goddess Laxmi. She not only satisfies your material wants but also gives you spiritual knowledge. All your efforts fall under two categories: preyas and sreyas. Upanishads describe sreyas (good) and preyas (pleasant) are two different purposes that bind a person. Therefore, there is a need to differentiate between the two. The person who prefers preyas will not progress towards life’s ultimate goal but will be pleased enjoying worldly pleasures. Pleasures are always sense-bound. But sreyas is that which leads a person to ultimate happiness, which is the goal of life. So, one should be able to differentiate between sreyas and preyas. Is he an orator or a Guru or a Sage or an incarnation? Who is this Nannagaru? 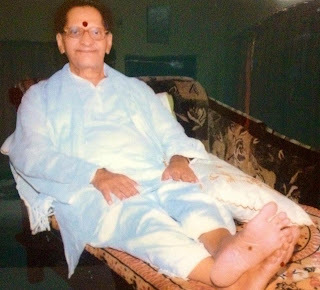 One good day I happened to visit him without any prior plan.Sri Nannagaru was seated on a sofa. The room was full with people and were focusing at him. Their faces reflected peace,purity and bliss. I could see a mysterious light in their eyes. Sri Nannagaru was dressed in white and looked very simple. The moment I saw Him, he smiled at me as if he knew me since long time. He asked me to sit in front of him and started conversing with me. I then introduced myself. Silence prevailed in that room for a while. I observed a hallow light shining just above Sri Nannagaru's head which was in the shape of half moon having a golden shadow. I remembered the words of a Sage who said that such hallow radiance is possessed only by those who represent divinity. When I came out of this thought process and looked at Sri Nannagaru, I noticed that he was looking into my eyes with concentration. Even I made an eye to eye contact with him. The moment I realized that all my secret burdens hidden within my heart are being revealed to him, a kind of shame and fear overcame me and I stopped gazing at him. I saw many rishis (who lived and did penance in himalayas), Swami's and Holy people in my life. But the sight of Sri Nannagaru gave me a new experience. After 6 months, when I came to know of Sri Nannagaru's visit to Hyderabad, I was very eager to meet him and therefore went to railway station. When Sri Nannagaru came out of the train, I offered my prostrations to his feet and stood very close to him. The moment I was watching him to my heart's content, he turned towards me and said very lovingly and graciously: " Saigaru, you took a lot of pain in coming here this early morning in this chilling weather. " Saying thus, He touched both of my cheeks with his hands. My heart melted with his touch. I experienced an unknown bliss flowing out from the depths of my heart and spreading across my body.Also a divine luminous light occupied every atom within me. One cannot express such a sweet experience in words. Such a state of bliss is imperceptible to body,mind and intellect. It is beyond one's imagination. My body was unable to tolerate that blissful state. When I feared what would happen to my body if the bliss increased by one more percent, Sri Nannagaru removed his hands from my cheeks. In order to divert me, he started conversing something relating to world, as if he is totally unaware of the state of my mind. I carefully preserved this unforgettable experience within my Heart. From that day onwards my mind got the conviction that Sri Nannagaru is not a mere human being. 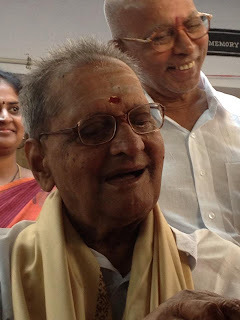 Later I met Sri Nannagaru several times and got answers to many of my material as well as spiritual problems. Sri Nannagaru has been providing solutions to all of my problems very lovingly and patiently. He is been guiding me to reach the goal. My association with Nannagaru has been since many number of years, however even today he possesses the same love for me. Sri Nannagaru has been blessing with his boundless Grace and providing solutions to the problems of each and every devotee who approached him. He has been doing this very patiently without any break. This is not possible to ordinary Gurus. Only their lives are blessed who would recognise Sri Nannagaru as a divine incarnation embodying the Knowledge of Shankara, the Compassion of Buddha, the Love of Jesus,the Heart of Ramana and the service of Vivekananda.